Life as a mermaid can be suffocating. Eviana Dumahl has returned home as a clan leader, an orphan, and a heartbroken teenage girl. Her parents are dead and her boyfriend, Brendan, has decided that he needs some time away. While battling her inner turmoil, Eviana is forced into the war that Lucian Sutherland has incited amongst her own kind. With the help of Kain, her friend and formally betrothed, the two work together to prove that they deserve their birthrights as young merfolk leaders. Betrayal, the second book in Amber Garr's Syrenka Series, is a riot of emotion. The pace is just as easily flowing as book one, Promises, and captures the audience's attention just as well. Garr twists and turns the plot so that events become unpredictable and very telling. Eviana is trying to step up and show her clan that she and Kain are suitable leaders, even in their young age. Eviana's series of training, both physical and mental, aren't enough to prepare her for the truths she learns and the biggest obstacle set in her path, Lucian Sutherland. In between all mermaid matters is Brendan, the love of Eviana's life and selkie. Their relationship has become tenuous and heartbreaking, and is most likely the biggest unknown in the story. There's no telling what's in store for the two with so many reasons for them to not be together. 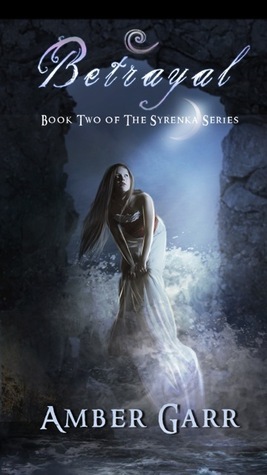 While Betrayal is a great story, it doesn't seem to have as big an impact in the Syrenka Series for the second installment. The plot changing revelation doesn't come until the near end of the story, and everything before it is more of a way to build upon the fantasy world presented and back up the reasons why Lucian Sutherland is a formidable foe. The conclusion of the series, Arise, will hopefully be the ending of all endings!